Supermarine got their first home league win of the season and their first in the league at home since April as they came from a goal down to dominate proceedings on Tuesday night versus Spencer Day’s Farnborough FC. Similarly to Saturday versus Weymouth, the game’s first chance resulted in a goal after ten minutes. One of Farnborough’s lightning fast wingers Michael Elias-Fernades sprinted clear of Jon Else down the left hand side, broke into the area and squared a ball across the face of goal that Connor Cullen couldn’t miss from a couple of yards out to put the visitors one up. Boro could have extended their lead only for Kev Sawyer to twice deny the equally quick, Andrew Sealy-Harris twice whilst Elias-Fernandes hit an effort over the bar. With the pace of Sealy-Harris and Elias-Fernandes Lee Spalding made a very early substitution, bringing on Dan Williamson for Jon Else to try and match the visitors for pace and a minute later, those chances would come back to cost Boro, as from a near post corner, Jerel Ifil scored his first goal in Supermarine colours, glancing home across the face of goal before being cleared from behind the line. This time, ‘Marine were on the favourable side of the linesman’s decision as he ruled that the ball had crossed the line. The goal ignited Supermarine into life. Joe Shepherd headed over. Conor McDonagh headed wide from a Connor Thompson cross. Bradley Gray went through one-on-one with Sam Mason who made a great initial save as the ball ricocheted back into the path of Gray and deflected over the bar. Shortly before half-time ’Marine scored twice as Stuart Fleetwood had a big impact on turning the game around. Firstly he created space to get free in the penalty area and squared for McDonagh to tap home to put the Blues 2-1 up. On the stroke of the half, Fleetwood rolled back the years to shake off a defender and curl a wonderful effort into the far top corner past Stroud from outside the box. Like the first half, the second had a slow start and the first chance of it would result in Spalding’s men taking a 4-1 lead. Thompson won the ball in midfield and fed the ball to McDonagh who got past the defender to cross for Brad Gray who skilfully tapped home into the corner of the net from 6 yards out. Elias-Fernandes pulled a goal back after 79 minutes when his effort went right across Sawyer and into the far corner which caused a few nervy minutes for the Webbswood crowd, particularly when sub Patrick Cox’s header rebounded back off the face of the post seven minutes later as everybody, including the Farnborough attackers stood and watched. ’Marine weathered a few late corners and held on for an excellent home win. 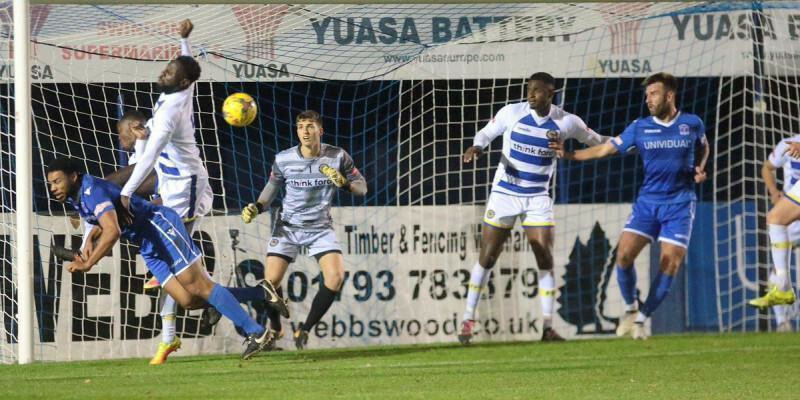 (Above) Jerel Ifil nets our equaliser in the 25th minute….